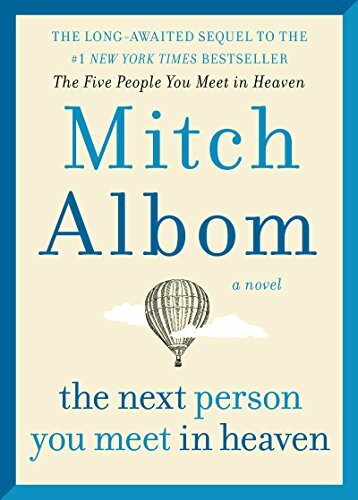 I sent those three words and a picture of Mitch Albom’s book, “The Next Person You Meet In Heaven” to my best friend, just two days after the novel arrived on bookshelves. We exchanged words of giddy elation, sent a few dozen exclamation points back and forth before I put my phone away and dove into this highly anticipated story. “The Five People You Meet In Heaven” is one of my all-time favorite books: Reading it years ago was a religious experience. Some of the book’s simple quotes have gotten me through some of the highest highs and lowest lows of young adulthood- While most people became Mitch Albom fans after “Tuesdays With Morrie,” this one sealed the deal for me. Truth is, I really wanted to love this book. The characters in “The Five People” had so much depth, were so raw, that it was impossible not to love them, sympathize with them, pity them. Eddie was someone that could be adored for his unwavering love and adoration for his wife… His father was so cold that the reader of the book could actually feel the hollowness of that relationship. The heroic and flawed traits of the characters were what made them so relatable; They tugged at heartstrings and penetrated the soul. I was surprised then, to gloss over “The Next Person” without so much as a tear. Annie’s life was spared after a tragic accident involving Eddie, the main character in the first book; The sequel gives us a glimpse into Annie’s life of stacked tragedies before meeting her own fate on the other side- she too is introduced to five people that teach her lessons and infuse some of the more difficult times of her life with meaning. In my opinion though, some of the characters were shallow in complexity and description and I found it difficult to relate. In the first book, I wrote down- at least- a quote per chapter for safe keeping. There weren’t too many “aha” moments this time for me. Perhaps it was the hype that I created, though- My dissatisfaction could be my own doing with sights set too high. Regardless, the storyline was decent and as always, Mitch Albom has a gift for sweeping a reader up with beautiful imagery and breezy vernacular. It was an easy read that left me content- not satisfied, but content- at the end. NOT GOOD FOR: I Think Anyone Can Read This And Appreciate Mitch’s Artistry… I’m Curious To Hear What Other Fans Think.